You are here: Home / Cat Health / I’m Unemployed and My Cat Has Fleas. Help! I’m Unemployed and My Cat Has Fleas. Help! I am hoping that you can help me with a question. I’ve been unemployed and living back at home with my cat, Newt. I used to volunteer for a local pet rescue, where I fostered a couple of cats and wound up adopting my Newt boy. Do you know of any resources that can provide financial assistance for expenses such as flea medicine? My cat hardly goes out and yet he has fleas — and I feel so bad (and guilty). Any info would be greatly appreciated! Siouxsie: Oh, Lisa, I feel for you — and for your Newt. 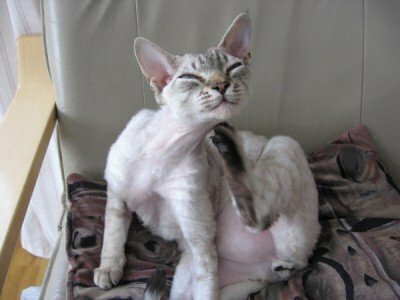 Fleas are just about the most annoying thing a cat can experience, especially if you’ve got a lot of them! Thomas: As you can probably imagine, organizations that offer financial assistance for pet care are feeling the crunch of this bad economy, too. Donations are way down, and the financial assistance that is available for needy people with pets is limited largely to spay/neuter, vaccinations, and emergency veterinary care. Bella: But don’t lose all hope, Lisa! We’ve got a couple of ideas for you. Siouxsie: First, have you considered talking to the rescue where you volunteered and adopted Newt? They may be able to connect you with a way to buy good flea control products at a discounted price. They probably won’t be able to give you any, because if they did, then they’d have to do it for everybody else. Thomas: Tapeworms are a pretty common side effect of flea infestations. Cats eat the fleas, which are carrying tapeworm eggs, while they’re grooming, and then the eggs are released into the cat’s intestines during the digestive process. So keep an eye out for evidence of tapeworms, too. Bella: If you do get the spot-on flea goop, you’re going to have to use it for at least three months to make sure that you’ve gone through several cycles of hatch-outs. Siouxsie: If you can’t find a way to get flea medications at a price you can afford, there is an inexpensive way to get rid of the nasty little buggers. It’s pretty labor-intensive, though. Thomas: First, mix together about two cups (or more if your home is big) of a powder made from half table salt and half baking soda. Sprinkle it on all the carpets, and under and on all the furniture, and let it sit for an hour or so. Vacuum your whole house, paying particular attention to places your cat likes to hang out, then dispose of the bag outdoors right away. If your vacuum cleaner is a bagless type, take the whole vacuum outdoors before you remove the dirt container. Do this once a week for three weeks. Bella: Then you’re going to have to wash all of your bedding, Newt’s bedding, pillow covers, throw blankets–pretty much anything that moved and that Newt sat or slept on, in hot water.You may have to do this once a week for a few weeks, too. Siouxsie: Bathe Newt (yes, you heard right, I said “bathe”) with a scent-free liquid soap. Mama likes Dr. Bronner’s castile soap for babies and sensitive skin because it doesn’t have any ingredients toxic to cats, but pretty much any shampoo designed specifically for cats, and most unscented baby shampoos will do, too. 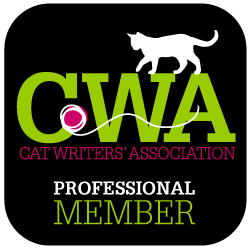 Thomas: There’s a good how-to on bathing cats at about.com, and Purebred Rescue has a great video demonstration on how to bathe a cat. And trust me, if anybody knows about bathing purebred cats, it’s people who have to deal with Persians! Bella: We’ve been told by those who’ve tried it that flea shampoos aren’t very effective anymore. Also, the pesticides can be toxic to your cat. The point of this bath is to get rid of any eggs on the skin and maybe drown a few adult and nymph fleas in the process. Siouxsie: After the bath is over and you’ve rinsed Newt and blotted him dry with a towel or two, use a flea comb to comb out any half-dead fleas and drown them in a jar of water with a couple of drops of dish detergent (water with a drop or two of ammonia also works well). Thomas: Keep this “drowning jar” and flea comb with you wherever you go. If you’re watching TV or reading a book and Newt crawls into your lap, pet him and casually search for fleas. When you find one, pick it off and drown it in your jar. Bella: This process is obviously very labor-intensive, but it works. Mama says she used it on Sinéad and Siouxsie when they got fleas when they were tiny little kittens — and the flea siege was gone after three weeks. Siouxsie: Just one more thing — as long as Newt keeps going out, he’s going to keep getting fleas. It’s been a really bad year for them this year. If it’s at all possible for you to keep him inside, this flea eradication program is going to be much more effective in the long run. My Cat is Diabetic and I'm Overwhelmed. Help! I'm Going to College and My Cat is Diabetic. Help! I'm afraid my cat might have had rabies. Help!